Over the last 40 years, Young Audiences Run for the Arts has helped schools secure over $17 million dollars for arts experiences and has become an established Northwest tradition. One of the most exciting parts of this tradition is the yearly student-designed T-shirt and printed materials. 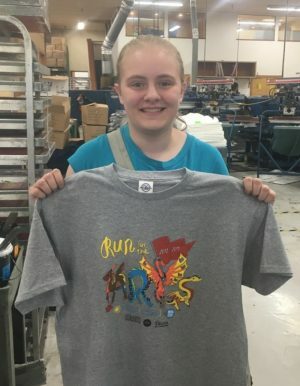 Your student’s artwork could be featured on thousands of shirts, posters and sponsor sheets. Designs should incorporate themes and images relating to Young Audiences Run for the Arts, including a variety of art forms (theater, music, dance, etc. ), physical activity, and community. Submissions for the 2019–2020 school year are due May 13th, 2019 and may be mailed to or dropped off at our office. They may be emailed if they are digital. All K-12 students in Oregon and SW Washington are eligible to submit a design. Finalists will appear on the Young Audiences website, and we hope to have a physical exhibition in the fall. One winner will receive a prize of $350, their design on T-shirts, posters and promotional materials, and the chance to work with a real graphic designer.